If you want to master the English language, you need to fall in love with the culture. Whether it’s music, TV shows, movies, or comic strips, the more you can enjoy English media, the quicker you’re going to learn English. Here at Real Life English, we believe language learning should be fun. It shouldn’t be a chore (something you feel obligated to do), it should be something you GET to do (as a privilege). What better way to enjoy learning the English language than to learn through comic strips like Garfield? For those who don’t know, Garfield is a lazy, lovable orange cat who has an obsession with eating, and a hatred for Mondays and diets. Why Garfield hates Mondays is a mystery because he is a cat, and therefore doesn’t work. Nevertheless, Garfield’s disdain for Mondays helps readers connect with him. The strip focuses mostly on the interactions and adventures (or lack thereof) of Garfield, Jon (his owner), and Odie (the dog), but there are other minor characters as well. Though it began as a comic strip, Garfield has also had two animated television series, two live-action films and three animated movies. One of the reasons the strip has become so popular is because of its lack of social or political commentary. It’s easy for anyone to enjoy. So without further ado (i.e. without anymore discussion), let’s have some fun learning English with Garfield! Before each comic, you see the title “Words to Know” which will include any words expressions you might have trouble with. Knowing these words beforehand will help you to better understand the jokes. Like this—here let me show you. Cutting back—to lessen the amount. For example, I’m going to cut back on watching television. Looking forward—excited for the future, anticipating a future event. Get something over with—to quickly finish an unexciting activity. Frolic—to play/walk about happily and excitedly. Clean slate—A chance for new opportunities, a fresh start. If you enjoy comics like Garfield check out the official website where they have hundreds of new comics for free as well as new ones every day. 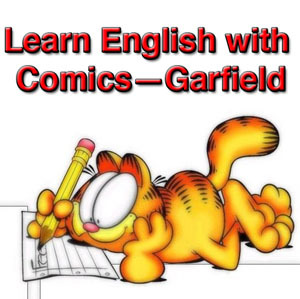 Spending just 5-10 minutes every day reading comics like Garfield and Calvin and Hobbes, is a great way to improve your vocabulary and deepen your sense of English speaking cultures and their sense of humor. Interested in learning more English through comic strips? Check out the article Learning English With Comic Strips—Calvin and Hobbes. Want us to write more articles like this? Show us you enjoyed the post by giving it a like, a tweet, and +1. So much fun!! And lots of new expressions too. Thank you! Very nice. I hadn’t thought to use Garfield! I saw Garfield said with sign language as word ” Love ” in hand. Could find one picture of them to email me? It is a great page.